National marine pest emergency response activities should continue to be implemented under the Intergovernmental Agreement on Biosecurity and the National Environmental Biosecurity Response Agreement. The Australian Government should support a national marine pest emergency response exercise. Based on the above, the Australian Government, in conjunction with Animal Health Australia developed the Marine Pest Exercise Program. The overarching Program aim was to improve participants’ understanding of the emergency response systems that are in place for introduced marine pests, and to develop appropriate skills and experience to contribute to an emergency marine pest situation through the delivery of two exercise components (Exercise One and Two, developed and delivered in conjunction with Turning Point Crisis Management). Additionally, the Program identified gaps and areas for improvement in responding to marine pests, and provided recommendations for future exercises to address these gaps as well as target known priorities of state and territory governments and industry. Exercise One was a scenario and discussion-based workshop held in February 2018 in Canberra and aimed to ensure that members of the Consultative Committee for Introduced Marine Pest Emergencies were aware of their roles and responsibilities during a marine pest response. Participants comprised of representatives from the Australian, state and territory governments, and also included the New Zealand Ministry for Primary Industries as an observer. Exercise Two also was a scenario and discussion-based exercise held in April 2018 in Sydney. The exercise invited key stakeholders from government and industry within the marine pest response space to explore the potential impacts and response activities that would be required in managing a marine pest emergency at a major Australian port. Participants considered and explored the various phases, requirements and considerations to be made during a response using a hypothetical invasive marine pest. 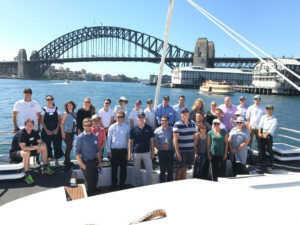 In addition, participants identified the implications from undertaking a response, especially within a highly active operational environment, which was visualised through a site visit of Sydney Harbour. To download the exercise summary report for the Marine Pest Exercise Program 2018 click here. If you would like a copy of the full Marine Pest Exercise Report, please contact the Marine Pest Sectoral Committee Secretariat at mpsc@agriculture.gov.au. If you would like more information specifically regarding Exercise One and/or Two, please contact Animal Health Australia at marinepest@animalhealthaustralia.com.au.